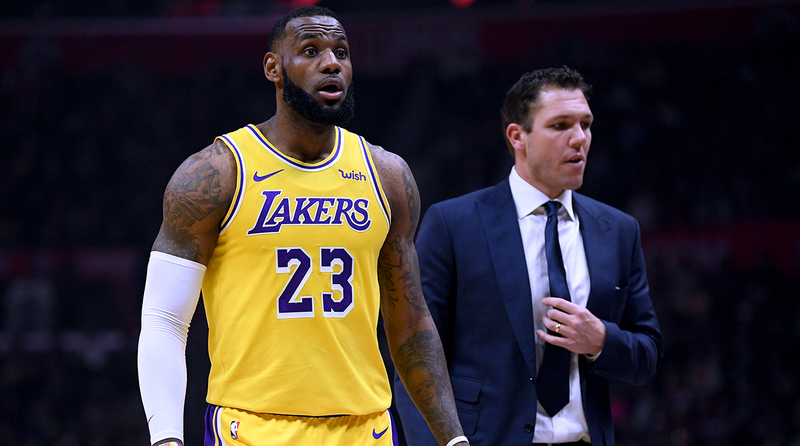 What should we make of LeBron James going to bat Luke Walton as Lakers head coach? The Lakers have hit rock bottom. Magic Johnson’s surprising exit stole the spotlight from Dwyane Wade and Dirk Nowitzski’s final home games. With Johnson gone, the focus now moves on to what the organization will do with head coach Luke Walton. Should Jeanie Buss fire him? Or will LeBron James push to keep him? On the latest edition of The Crossover podcast, Chris Mannix and Rohan Nadkarni debate whether it is too late for LeBron to defend Walton and more. "(You have to) control what you can control, and you've got to play the hand you're dealt. “I think (Walton) played the hand as well as he could. "Nobody expects for injuries to happen the way they did with our franchise this year. ... I'm not talking two or three games here, everyone's back in the lineup. We're talking 15, 20, 25 games. I saw something the other day where myself, B.I. (Ingram), Zo (Ball) and Kuz (Kyle Kuzma) only played 23 games together this year. 15-8. We had a defensive rating of fourth in the NBA, and we were like seventh in offense when we played together in 23 games. As good as that is, it's not enough for Luke to even be able to know what he has on a consistent basis, when you don't have a consistent roster every single night throughout a full season." Rohan what do you make of LeBron James going to bat for Luke Walton at the very end? Rohan Nadkarni: I feel like what LeBron is doing is damage control. The narrative all season long was him trying to get rid of Luke. Here is the thing about LeBron James. I am a big LeBron James fan—everything he has done off the court, the moments he has provided us basketball fans on the court and even the people who hate LeBron James can’t help but watch everything that man does. LeBron needs to get a lid on all the noise that surrounds him. It’s one thing when his teams are winning and it is one thing when he is taking Cleveland to the Finals. I want him to comeback and be the LeBron James we know and love next season. I want him to destroy teams. I want him to play all 82 games. But what I hope he takes away from this year—is to get a lid on all the noise around him. He has to find a way to get rid of this weird Rich Paul cloud that kind of hangs around his shadow. He has to stop feuding with his coaches. And I know in year 17, that is going to be kind of weird to expect this big change for him but for him to come out and now defend Luke Walton, it just feels hollow right? What is he going to say when Luke Walton is fired and we go back and read these comments. It is just too little, too late. I just think LeBron needs to get a lid on all the noise around him and kind of stop feeding these narratives. When I see a quote like this—where was it during the season when there were all these reports when you wanted Luke Walton gone and you didn’t address it then. There is just too many things he didn’t address during the season for this to feel impactful to say it now when Luke has one foot out the door. Mannix: Yeah, I agree with that. I think LeBron has to be careful because if Luke Walton goes, who is up next? There’s not a very long list of guys the Lakers could bring in that have the gravitas necessary to coach LeBron. If Luke Walton gets fired this week or next week, maybe Tyronn Lue has a chance to get the job, I will understand that. Lue is a very good coach and I think he did a very good job at bringing that Cavaliers team together and of course what he did in the Finals a couple of years ago to help lead them back against Golden State in that series. That’s a solid hire. But if Ty Lue doesn’t want the job—who else is out there? You can’t turn around and do what some of these other rebuilding teams do and hire the hot assistant coach. You can’t hire the Kenny Atkinson’s of the world—assistant coaches that turn out to be terrific coaches. So does that mean bringing in Mark Jackson? Is that somebody that you want to bring into that mix? I don’t know. If you are LeBron and you are comfortable with Luke Walton, you should want the Lakers to retain him.